Congratulations and thank you on purchasing your new Baby Lock embroidery machine with us. As part of your continued learning we invite you to join us for our Embroidery Club. We typically meet the first Wednesday morning of selected months. Always check the date as at times we may need to change the date. Join us to make this Patchwork Free Form Table Runner. 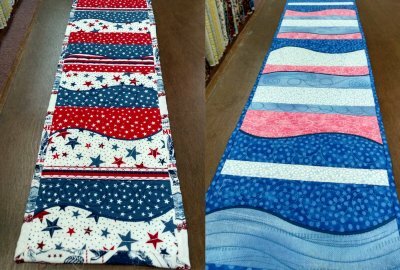 There are 4 different blocks that you can utilize when creating your own table runner. These designs will also make wonderful placemats. Once the blocks are done, the table runner is sewn together on the sewing machine. This class will focus on using either the 5x7, or 6x10 hoop.